Packing for two months in a 55 liter backpack is a nightmare. Ok, fine that’s a bit dramatic, but it’s difficult! I already had a list of things I needed to bring and I did a trial packing a few days earlier. Everything fit just fine! I thought I was all set. Yet, somehow I slowly added a couple of items and my backpack wouldn’t close! My clothes are pretty small and I figured a few extra tank tops would be fine…WRONG. EVERY inch of space counts. I originally wanted to put all my stuff in packing cubes, but it ended up being a bit bulky. I ended up having to switch some of the cubes with some extra stuff sacks Marc had. Those are great because they’re thin and mold-able. I had to take out a few things from this picture. Osprey Farpoint 55 (3300cu in) which has a removable daypack – I LOVE THIS BACKPACK. It’s magical. It’s so comfortable and easy to use. You can easily check the bag at the airport (and not worry about the straps). I’ve also used it as a carry-on before too (I removed the daypack though so it doesn’t look too big). Travel bag/purse – I had no idea what kind of bag to travel with. I already had a money belt, but I needed a real purse to carry things in. Most of my bags are too impractical for this trip, so 3 days before we left for the trip, I found this awesome Travelon Anti-Theft cross-body bag. I was convinced by all the Amazon reviews where people who almost got robbed but the anti-theft quality of the bag prevented it! 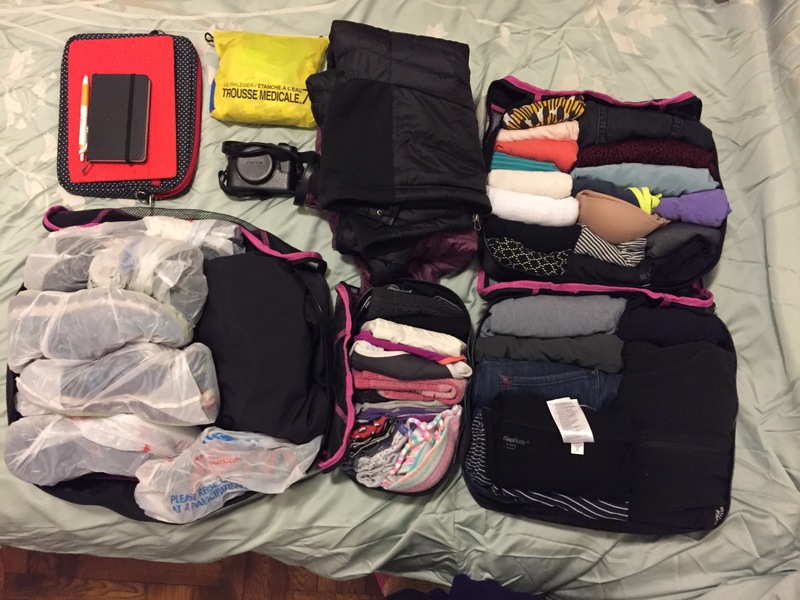 Packing cubes / stuff sacks – I’m not too happy about my packing cubes. They’re too bulky, but they have made it really easy to find things. Collapsible water bottle I left this in an Uber in Lima and asked the driver to bring it back. And he actually did! I tipped him half the price of the bottle’s retail value (because I don’t know if I’ll find another one here)! Camera – I am not a DSLR user and I am no pro photographer. Even if I were, I wouldn’t want to carry it around. So I bought the Sony DSC-RX100 III a few months before the trip to start practicing. This camera is PERFECT for me. I’m an amateur but I love great, quality photos. I don’t have the patience for the perfect shot sometimes so the auto function has certainly come in handy. I also had 20% off the retail price so it wasn’t too bad for the quality.